I am definitely one of those college students whose diets has suffered immensely since coming to college and no longer having the luxury of healthy home-cooked meals every night. I simply don’t have the time or the resources to eat good, hearty, healthy meals. Instead I find myself turning to things like Fiber One bars for a quick and easy snack. Now, I did used to eat these at home too, but not nearly as often. So I started wondering if these bars are actually good for me. I figured I should do some research for myself instead of relying on the package. So, as can be inferred, Fiber One bars are not meant as substitute for meal. I can tell you that there definitely isn’t enough to them for them to be able to substitute for a meal. And in addition, we should be looking for other sources of fiber to add to our diets instead of just relying on one bar. The human body needs fiber, and it should always be included in our daily diets because it lends to the health of our digestive systems. 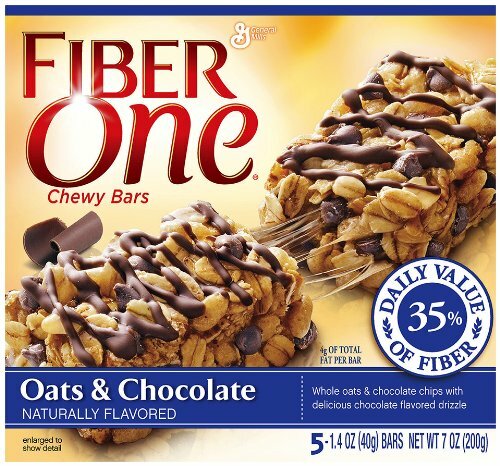 Now, Fiber One bars contain about 9 grams of fiber. However, it’s recommended that men eat 38 grams and women eat 25 grams of fiber a day. So don’t rely on one Fiber One bar to get you all the fiber you need for the day! Consider throwing some fruit in your diet, specifically apples; their skins are rich in fiber. I was really hoping to find some studies that either proved or disproved the hypothesis that Fiber Ones help contribute to a healthy diet. Unfortunately, I found none. If I were to do a study like this, I would have t wo groups, both eating the exact same diet, but with one group eating one Fiber One bar a day while the other doesn’t. However, third variables like starting health, previous dietary habits, hereditary conditions, and more would need to be taken into account. It may well prove difficult to conduct a study like this, especially because I have limited scientific knowledge and cannot form a better idea for an experiment or study. Now, though Fiber One bars provide us with good nutrients such as fiber and calcium, as well as helping to lower cholesterol, they do of course have some downsides. This article talks about how fiber can be bad when had an excess, particularly when had after not eating enough fiber for a while. Too much fiber all at once can lead to the following: bloating sensations, abdominal cramps, an increase in flatulence, and even the rare occasion of intestinal obstruction. Most of these side effects are temporary, and they do not mean that eating Fiber One bars are bad. So, in conclusion, it turns out that Fiber One bars are a good thing to eat for a grab-and-go snack. As long as they’re eaten in moderation, and followed by a full meal. This entry was posted in Uncategorized on October 21, 2016 by Angela Maria Napolitano. My mom has always told me to eat foods in the morning that are rich in fiber. This post confirmed the fact and now maybe I will simply eat fiber one bars for breakfast to increase my fiber intake in the morning. Sometimes, I even find myself skipping breakfast. Thanks for sharing! I used to eat a nice breakfast every morning before school because I enjoyed having a nice start to my day. Coming to college however made that impossible! I have adapted to either not eating breakfast at all or just grabbing a random breakfast bar or something from my snack cabinet. I recently started to enjoy Belvita breakfast crackers but have been looking for a variety of different option. After reading this I think I might try some Fiber One bars! I used to stay with my great aunt as a kid and every morning before school we would sit down to the same breakfast: Fiber One. Not the delicious cereal bars you’ve been substituting but the brown logs that are meant to be cereal. This stuff is so old fashioned I don’t even think they sell the gross stuff I used to eat. However I eventually got used to it and actually enjoyed it at a point in my life. Here’s a little bit about why the fiber is so dang good for you! I like how even though you could not find an exact study you still decided to investigate this topic. I think that your suggested experiment makes a lot of sense and it is smart to take the confounding variables into account. I found this article http://www.livestrong.com/article/375177-are-fiber-one-bars-healthy/ about the health benefits of fiber one bars and I thought you might find it interesting! !